Recounts "The Great Battle Never Fought,” the Mine Run Campaign of 1863. It is the final chapter of the forgotten fall of 1863—when George Gordon Meade made one final attempt to save the Union. The stakes for George Gordon Meade could not have been higher. After his stunning victory at Gettysburg in July of 1863, the Union commander spent the following months trying to bring the Army of Northern Virginia to battle once more and finish the job. The Confederate army, robbed of much of its offensive strength, nevertheless parried Meade’s moves time after time. Although the armies remained in constant contact during those long months of cavalry clashes, quick maneuvers, and sudden skirmishes, Lee continued to frustrate Meade’s efforts. Meanwhile, in Washington, D.C., Meade’s political enemies launched an all-out assault against his reputation and generalship. Even the very credibility of his victory at Gettysburg came under assault. Pressure mounted for the army commander to score a decisive victory and prove himself once more. Smaller victories, like those at Bristoe Station and Rappahannock Station, did little to quell the growing clamor—particularly because out west, in Chattanooga, another Union general, Ulysses S. Grant, was once again reversing Federal misfortunes. Meade needed a comparable victory in the east. The Great Battle Never Fought: The Mine Run Campaign, November 26-December 2 1863 recounts the final chapter of the forgotten fall of 1863—when George Gordon Meade made one final attempt to save the Union and, in doing so, save himself. Chris Mackowski is a professor in the School of Journalism and Mass Communication at St. Bonaventure University in Allegany, New York. 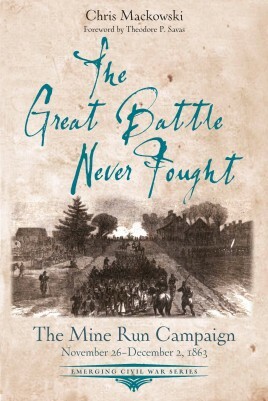 Impressively researched, profusely illustrated, exceptionally well written, organized and presented, this historical study by Chris Mackowski (a Professor in the School of Journalism and Mass Communication at St. Bonaventure University in Allegany, New York), "The Great Battle Never Fought: The Mine Run Campaign, November 26 - December 2, 1863" is a part of the Savas Beatie 'Emerging Civil War Series' and unreservedly recommended for the personal reading lists of Civil War buffs, as well as a core addition to both community and academic library American Civil War History collections and supplemental studies lists.